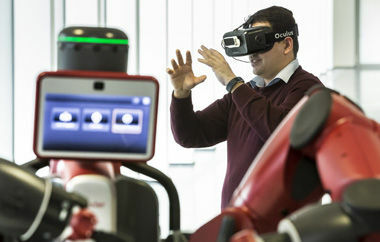 The German Research Center for Artificial Intelligence (DFKI) has become Germany’s leading research center in innovative commercial software technology using Artificial Intelligence. Today, at the height of interest in artificial intelligence, the DFKI is an international beacon. DFKI develops solutions, product functions and prototypes in the field of information and communication technology based on application-oriented basic research. Intelligent mobility solutions are one key research focus of the DFKI, which was established in 1988. Be it robot control, language technology, intelligent networks or augmented reality – there is hardly a field of technology that is not covered by its 1000 or so scientists from more than 60 countries. The 180 different research projects have one thing in common: computers and artificial intelligence play a central role in all of them. DFKI researchers have long been experimenting with neural networks – mathematical filters connected in series. Computers sift through data, which allows them to identify patterns. The self-learning and intelligent programmes recognise visual content, understand language and can assess emotions in social networks. DFKI serves as a stepping stone to leading positions in industry and successful careers as founders of spin-off companies. Over the years, more than 140 staff members have been appointed professors at universities in Germany and abroad. DFKI has facilities in Kaiserslautern, Saarbrücken, Bremen, Osnabrück, Oldenburg and Berlin. Close collaboration between the DFKI and its partners in science and industry allow pure and applied research to be combined and ideas to be put directly into practice.